Gangsta (ギャングスタ) is an anime adaptation of the recently-licensed in Europe and US original manga by Kohske who did both the art and the story for it. A classic seinen story – males, jacks of all trades, gangs, mafia, prostitution and violence. This manga has it all. The question is – will the adaptation team be good enough for it? Gangsta will air on 1st July 2015 on ABC with Tokyo MX following on the 5th and BS11 on the 8th. Warning: Spoilers head. Warning: Story is rated R.
Gangsta focuses on the urban adventures of Worick and Nic – a deadly duo for hire who are there to keep the order in Ergastulum – a city full of dangers and mishaps. Soon after the beginning, they are joined by the mistreated Alex, a former prostitute who turns out to be the very thing the two need. Their company is called Benriya and their headquarters is in the 8th district. The thing that changes it all for them, however, is a job they are hired for, a job by the one cop in Ergastulum no one would want to cross. The Celebre drug – the thing that gave extreme powers to those who used it. It gave birth to the “Koukon” or “Twilight” people. The name belongs to the descendants of the ones who used this substance. The Koukon are registered and controlled via chips, inserted into their bodies. Another name for them is “Tagged”. The tags bring information not only about the location and vital stats of the Twilight, but also about how strong they are (rumoured). Supposedly, D/5 means `default` (lowest) while S/0 `strong` (highest). All of them are obliged to abide three rules: Do not harm humans. Follow the humans’ orders (unless it goes against the first rule). Defend oneself (unless it goes against the first and second rules). Click on the image to see them all! Worick Arcangelo a popular individual in the city of Ergastulum and a co-founder of Benriya. He has a cheerful personality and is always ready to harbour a stray. He has a negative attitude for many things, including Twilights, but his side is often hidden behind jokes and irony. Nicolas Brown a Twilight (tag A/0), former mercenary and a co-founder of Benriya. He is born deaf and rarely speak to people. Has a dark and sarcastic sense of humour. Alex Benedetto a former prostitute and the current Benriya secretary. She is envied by the females and wanted by the males, although usually wearing only plain clothes and no accessories. Inspector Chad Adkins is a high-ranked officer in the local Police Department. Often calls Benriya for help on more shady jobs. Cody Balfour a young officer and Insp. Adkins’ junior partner. He always follows the rules and is confused when the things don’t go as planned. Daniel Monroe is the Monroe family leader and the main person for the overall protection of the Twilights in Ergastulum. Dr. Theo the main doctor in Ergastulum who works with Nina in the local clinic. He is the go-to-person for Nic’s medication and overall Benriya treatment. Yang Delico’s friend and Monroe family subordinate. He is 100% certain in his firefighting abilities, but shies away when teased outside of work. Nina a 12.y.o. nurse-in-training at Dr. Teo’s clinic. She is also one of the people who call upon the Benriya for various tasks. Ginger a Twilight (S/5) and Gina Paulklee’s main subordinate. Besides the usual violence common in all children of the Celebre drug, she has an awkward personality and often stutters. Gina Paulklee is another Twilight (?/?) and Paulklee Guild’s leader. Her personality is full of confidence and dark humour. Delico a Monroe family member and a Twilight (D/0). He has intense charisma and heterochromia. He and Yang lived in the same orphanage and are long-lasting friends. Miles Mayer a member of the Monroe family, often seen as Daniel’s right-hand man. Usually clam and composed, his guilty pleasure is teasing the younger family members. Ivan Glaziev another Monroe family member with a joker-like personality. Directing the anime is Shukou Murase while Tsutchie is writing the scores for the music. The character design is in the hands of Youichi Ueda. As you know, I did a short review of the manga when EGScans started their mangazine in January 2012. It had caught my attention at the time and I have kept on reading with love. Now, it was officially licensed in the region covered by EGScans, and they have given the project up (proving how great they are one more time). Nonetheless, I am more than excited to see this story go live with animation and the great work of the director who worked on Ergo Proxy, Argento Soma and Witch Hunter Robin. 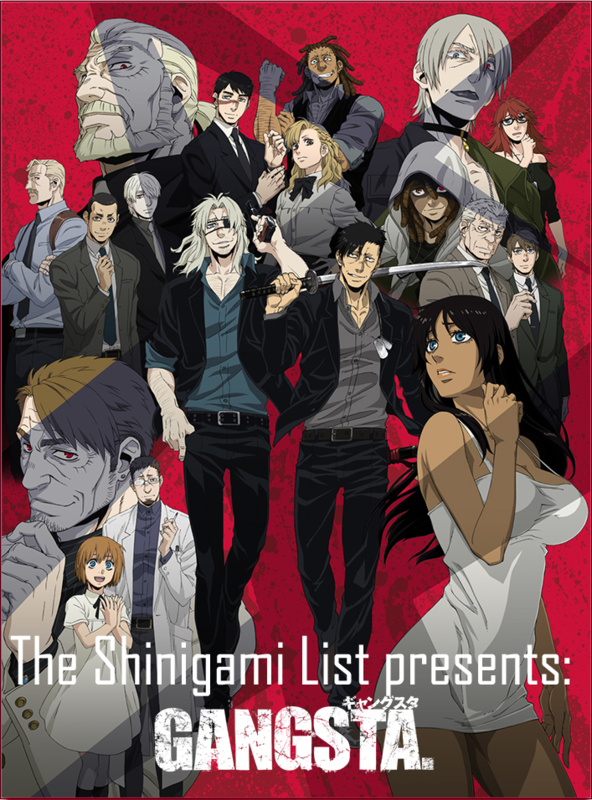 Gangsta is just one of the 2015 summer anime season. Check out more in the Guide. Nice it is rated R. This way we may hope for an actual seinen anime. I love the animation of Ergo Proxy, Argento Soma and Witch Hunter Robin. There is certainly a signature style, so I am very anxious to see this anime. Meaning they are all same-ish? Looks off and too colourful to me. Yep, man…it’s been cooking for a while.